James Bond travels to Japan and goes for broke in the culturally insensitivity department in 1967’s big and broad You Only Live Twice, with a screenplay by famed author Roald Dahl (writer of beloved classics like Willy Wonka, The BFG, and many more). I only remembered pieces of this one before re-watching it, vaguely recalling that Bond dies, gets married at some point, attends a badass ninja school, and tries to become Japanese himself by getting a weird haircut. Turns out I was mostly right! All the classic Bond tropes are really amplified in You Only Live Twice (which Austin Powers had a field day with), both for better and for worse. The cascading strings are really catchy and form the backbone of a theme that becomes an instant earworm (click the above link at your own risk). It’s proven resilient over the years, finding new life by being sampled and covered many times. The central melody alone is enough to ensure its lasting impact, but Nancy Sinatra adds a sultry yet innocent element that works well with the song’s delicate orchestration. Apparently producers wanted Aretha Franklin originally – I imagine that would’ve been a different song entirely but still great nonetheless. The opening sequence finds an orbiting American spaceship being swallowed whole by an unknown craft, causing the U.S. to quickly point fingers at their Soviet foes. Meanwhile, the beauty Bond’s bedding in Hong Kong gets the drop on him and has him killed, all before the opening credits even roll. Of course Bond’s death is a giant fake out, and his burial at sea is short lived as he’s quickly recovered and brought back into action aboard a secret MI6 sub. His mission – to go deep undercover in Japan and avert certain nuclear war between the U.S. and Soviets as the cold war gets hot. You Only Live Twice finds Bond up against SPECTRE again, with the villainous organization’s Number One mastermind finally revealed. 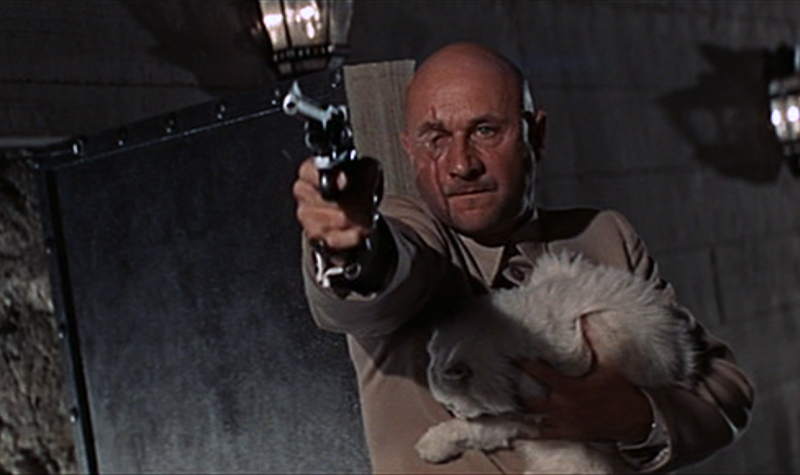 Donald Pleasance plays Ernst Stavros Blofeld in all his cat-stroking, facially scarred, pant-suit wearing glory. This evil genius is likely Bond’s greatest nemesis. Before the faceoff between Blofeld and Bond occurs, there’s plenty of action to sate audiences attuned to Bond’s non-stop violence. When Bond first infiltrates a Japanese office building he ends up in brutal fist-fight with a foe he subdues with furniture. What I’m saying is Bond throws a couch at a guy. Later – in the most obvious foreshadowing ever – a custom one man helicopter (and its deadly gadgets) is introduced by Q, only to be used in an epic aerial battle in the very next scene. During a chase, a car pursuing Bond is lifted up a giant magnet and flung to the sea (Bond cracks “Just a drop in the ocean”). A rooftop brawl at a dock finds Bond evading a veritable army of club-wielding foes, during which a long, unbroken helicopter shot provides the film with its most unique grace note (and feels very ahead of its time). The finale goes large too, with a ninja army invading Blofeld’s volcanic base in an all out war that racks up the body count. The ninjas alone move You Only Live Twice up a notch or two. Bond doesn’t close the deal with his first paramour, as she ends up “killing” him before he can do so. In Japan, Bond is taken into the home of his contact Tanaka, who intones the immortal line “In Japan, men come first and women come second” before introducing Bond to a bevy of masseuses he has on retainer (presumably). Later, Aki (Akiko Wakabayashi) is introduced as an extremely capable ally of Bond, saving his bacon on multiple occasions. She’s the main female love interest and there’s good chemistry between her and Connery’s Bond, which is abruptly cut short when she dies from poison intended for James. Aki probably deserves a more respectful storyline that the movie provides, but she’s still a highlight. 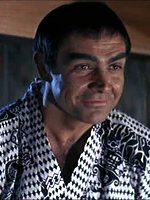 For his part, Bond recovers remarkably quick and marries another girl (Kissy Suzuki, another great name in an increasingly long line of them) in the very next scene, blunting the impact of Aki’s tragic death. There’s also a red-headed SPECTRE agent named Helga that ties Bond up and seduces him, leading Bond to sarcastically quip “Oh the things I do for England”, even though we know drilling for information is his favourite part of the job. Bond attends a Ninja school! And learns to be a ninja! Bond’s fifth movie spits in the face of YOLO and defiantly says You Only Live TWICE. Yes, there are some groan inducing puns, but I can’t lie – many are hilarious. And yes, there’s some cringe-inducing cultural tone-deafness on display that must’ve been borderline racist even in 1967. If you can look beyond those stumbling blocks (and grant the benefit of the doubt – that the producer’s intent was to simply make benevolent entertainment) then you’ll find You Only Live Twice to be a fast-paced adventure with plenty of standout moments. Some of the screenwriter’s machinations are plain to see and the formula is becoming all too clear at this point, but the scenery (shot on location in Japan), well-orchestrated action, and swift pace all combine to make an exceptional entry in the Bond series.